The Terminator is being held captive. After running into Robin’s new Teen Titans, Deathstroke was bested by the son of Batman and locked away in Robin’s secret prison. However, despite this victory, Deathstroke is already putting doubts in Damian’s head that this is all part of Slade’s plan. 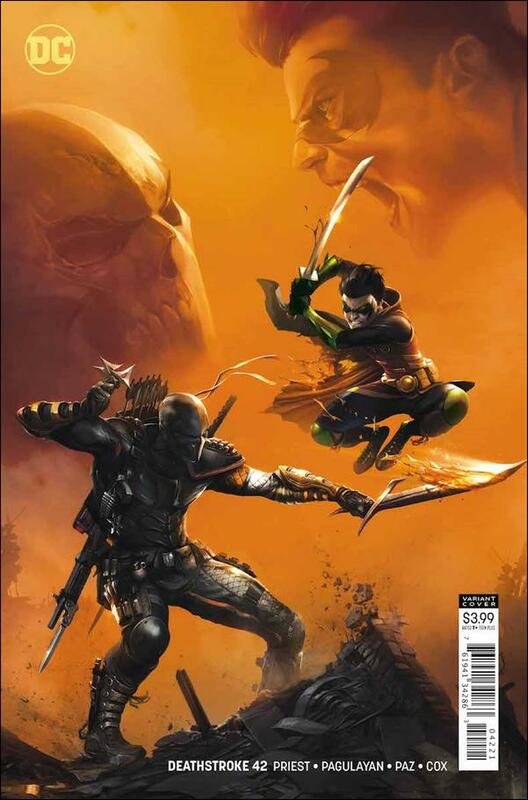 Inside Damian’s secret prison, the other villains there begin trying to get Slade on their side. Black Mask goes as far as putting Slade in charge of the group in an attempt to form a plan for a breakout. All Slade says in response is that Robin has “gone too far now.” Elsewhere in New York, a young man leaves his mother’s hospital room vowing to make who did this to her pay. As he leaves, the Teen Titans stand at the ready outside. The entire team is cloaked in magical disguises made by Djinn to keep an eye on the young man. As the young man approaches a police officer, a voice tells both Robin and Kid Flash that the boy is going to kill the officer. When Kid Flash speeds by and grabs the boy’s backpack, it triggers a bomb. As the rest of the team moves in to take down the young man, who dawns a suit of armor and reveals his name to be Blackrock, Robin deduces that Slade escaped from the prison. In fact, Slade not only escaped, but he’s making himself at home inside the Titan’s base of operations. Exactly what Slade is planning is unclear at the moment. However, even with his full plan still being shrouded in mystery, it’s clearly working. Just by simply talking to him, Deathstroke was able to throw Robin completely off his game and cause a massive amount of damage. My problem with this issue was that Kid Flash discovering the secret prison was completely grazed over and only mentioned in passing by Slade once. To me, this should be a huge plot point that causes tension within the team. Hopefully, in the coming issues, we’ll see that play out. But for now, Slade will continue playing his head games with Damian, and Damian will probably keep falling for them until it’s too late.